Sonic Arch/Ankle Tighteners are a great way to add extra arch or ankle support to any type of skate - inline or ice - and they work on any brand of skate, not just Hypno skates! Designed by roller hockey players, Sonic Arch/Ankle Tighteners use a rugged 2" (5 cm) wide, heavy duty velcro strap that wraps around your ankle or arch. The velcro holds tight and will not slip or peel off until you remove it. Hypno skates use an internal support system, rather than the usual external plastic support that most inline skates have. As a result, some people find they need a little extra ankle support. The addition of the Sonic Arch/Ankle Tighteners solves this problem. For best results, tighten the laces, or velcro strap (in the case of the Stealth model), as tight as you can and then wrap the Sonic strap over the laces and Hypno velcro strap. Pull it tight and it will hold firm until you're ready to remove it. If you need additional ankle or arch support for your inline or ice skates, this may be your answer. 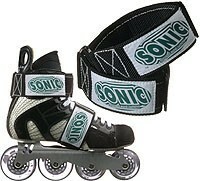 IMPORTANT NOTE FOR HYPNO SKATES: Use these straps only for ankle support on Hypno skates. Do not use for arch support as they will interfere with the chassis mount, causing the chassis to separate from the boot during skating.